In the 1920ies and the early 1930ies, the Social Democrats had a firm grip on the city of Vienna - it was the period of the "Red Vienna", with excessive social building of public facilities and housing. For details, read my article on the "Red Vienna and the Karl-Marx-Hof". One of the biggest communal living blocks - and probably my favourite of the very big ones - is the "Rabenhof" in the third district or Landstraße. It is a building in mostly dark brick and shades of grey and red. I lived around the corner of the Rabenhof for several months and so I know the area fairly well. The Rabenhof ("Raven′s Court") was designed by the architects Hermann Aichinger and Heinrich Schmid and built courtyard by courtyard on the site of a former army base, the Krimskykaserne. 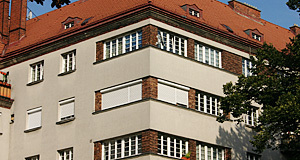 When it was opened in 1927, it was called "Austerlitzhof", named after the politician Friedrich Austerlitz. It was re-named after the February Revolt so that it had a less left-wingish name under the conservative rule; in 1949, another communal building block in Ottakring, the 16th district, was named Austerlitzhof and so the name Rabenhof became the permanent one. Even for a communal block in Vienna, the Rabenhof is particularly green - only 38 percent of its total land is used for houses, the rest is parks and two playgrounds. There are 78 staircases that lead to a total of 1,200 apartments, one kindergarten - and a theatre. More on the theatre below. The Rabenhof has - like many of the very big communal blocks - a distinct spirit, fostered by its own newspaper and website. It has featured on TV and is well-known in all of Vienna for the theatre. The "Rabenhof Theater" was originally a movie theatre and a rather modern facility in 1934 - typical for socialist communal buildings, who wanted to emphasise a progressive spirit, modernism, technophilia and progress on contrast to the conservatives. Between 1927 and 1934, the facility had been used as the "Arbeiterfestsaal" or "Labourer′s Celebration Hall". When it was transformed into a cinema, it had a capacity of 400 people. With the rise of TV, the golden age of the cinema ended - and the one in the Rabenhof closed in 1971. The facility was used for all sorts of events and social occasions until 1990. Then it became the second alternative stage for the traditional Theater in der Josefstadt. Ten years later, in 2000, the Theater in der Josefstadt and the Rabenhoftheater split up and the latter one became a fully independent stage. The first manager was Karl Welunschek, in 2003 Thomas Gratzer followed him. The Rabenhoftheater is still aware of its socialist roots and its program tries to include artists from different ethnic backgrounds. The general public, however, sees the Rabenhoftheater primarily as a Cabaret and comedy stage, which is another key aspect to its program. The Rabenhoftheater is easily accessed via the subway U3. Attractions nearby are limited - the area around the Rochuskirche Church is within walking distance, alongside with the Flak tower in the Arenberg park. Further north, you find the Palais Wittgenstein and the Hundertwasserhaus. To the south, the cemetery of St. Marx is nice and westwards, you will find the Arsenal and the Schloss Belvedere Palace. None of these sights are terribly close, though.